Learning to make and decorate cakes that are as beautiful as they are delicious can be a challenge, but with the expert guidance of renowned confectionery artist Autumn Carpenter in First Time Cake Decorating, your goal is within reach. Like having your very own cake decorating instructor at your side, First Time Cake Decorating guides you expertly through the process, from baking and prepping your first cake through a range of decorating techniques, from essential piping techniques for creating borders, writing, and flowers to working with gum paste and fondant to make stunning daisies, roses, lilies, and more. There’s a first time for everything. Enjoy the journey and achieve success with First Time Cake Decorating! Based in Fort Wayne, Indiana, Autumn Carpenter is a nationally known confectionery artist, author, and demonstrator. 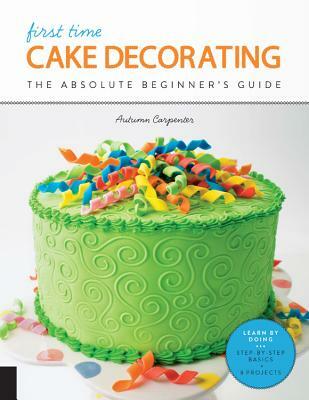 She has published several books, including The Complete Photo Guide to Cake Decorating, The Complete Photo Guide to Cookie Decorating, and Decorating Cakes, Cupcakes, and Cookies with Kids. She demonstrates annually at the I.C.E.S. (International Cake Exploration Societe) and travels across the United States, sharing the craft of cake decorating and other confectionery arts. Autumn is co-owner of Country Kitchen SweetArt, a retail cake and candy supply store that has been in her family for over 45 years. The business caters to walk-in store sales, catalog sales, and an online store, shopcountrykitchen.com. Autumn has developed her own line of useful tools and equipment for cake decorating and cookie decorating, and sells them online and in many cake and candy supply stores throughout the United States and in several other countries. Her cakes and products have been featured in numerous publications and magazines, including American Cake Decorating and Cake Central.